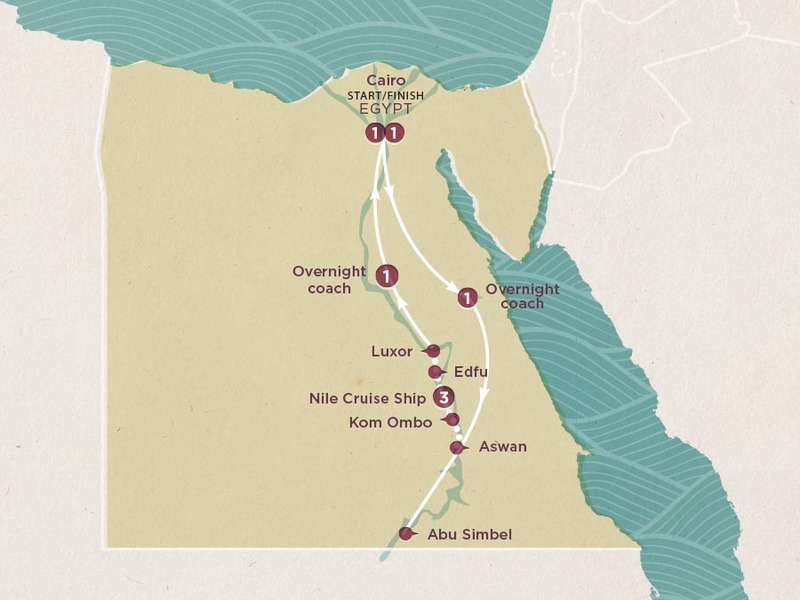 On our Nile Discovery trip, you’ll swing past Egypt's most important historic sites – with a 5-star Nile cruise thrown in for good measure! A qualified Egyptologist will unlock the secrets of ancient Egyptian history at every major site, including Abu Simbel, Luxor, Karnak, the Valley of the Kings, the Pyramids and Sphinx, the Egyptian Museum and more. Ready to soak up some history? Yeah, you are! Welcome to the city of a thousand minarets and watch the madness of Cairo’s traffic jams from a kahwas (coffee shop). But first, rock up to tonight’s welcome meeting and meet your new friends. There's old, and then there's the necropolis of Saqqara. Soak up some ancient history, meander Coptic Cairo and get your haggle on in Khan el-Khalili market. Remember the time of ancient Nubia sailing along the Nile on a felucca sailboat and later, a culture lesson in a brightly coloured traditional village. Then, climb aboard your five-star chariot (replete with rooftop pool, sun lounges and belly dancing) for a taste of life finer than the pharoah’s could have ever imagined. Come face to face with awe-inspiring Abu Simbel, presided over by four gigantic statues of Ramesses II. And then: what’s cooler than Kom Ombo temple? The fact 300 mummified crocodiles were found nearby. The eye of Ra is watching you today as we head to the Temple of Edfu. Get acquainted with the falcon-headed sky god Horus. After that, kick back on deck and drink in the beauty of the Nile. Take a walk through the shadow of the Valley of Kings and go for a Temple trifecta ticking off Hatshepsut, Karnak and Luxor plus Colossi of Memnon before heading back to Cairo. Walk like an Egyptian into King Tutankhamun’s treasure chest at the Egyptian Museum – home to over 160,00 relics – then gain some perspective at the base of the 138-metre Great Pyramid of Giza and the Sphinx. Shisha! Is the trip over already? If your inner explorer has been stoked, stay on to uncover more of Cairo’s coolness. We’re outta here after breakfast.